The pressure gauge on a private water-well system usually receives little attention until a problem develops. The small gauge plays a crucial role in monitoring the performance of a water-well system. 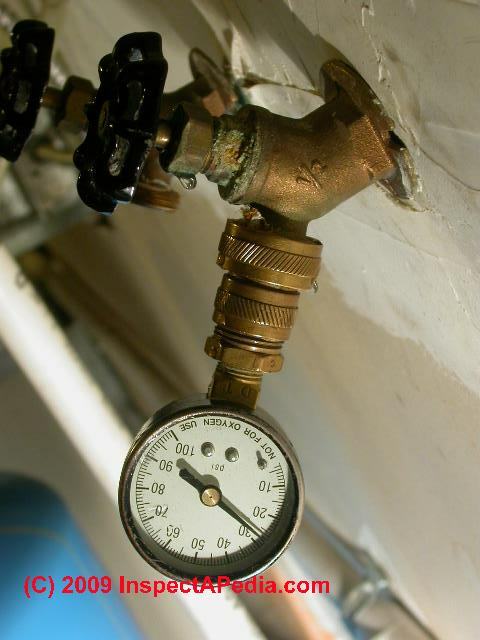 Water-well owners should replace a pressure gauge if it is suspected of being defective. In the short run, a water-well system can operate without a gauge. The gauge only provides an ongoing visual display of the water pressure level. The well pump is switched on and off by a separate component, the pressure control switch. Although the control switch also constantly detects pressure, it has no visual display. In the long run, a properly functioning gauge is essential to help identify potential problems with other system components. Aside from the force of water exiting your water outlets, the pressure gauge may be the only visible indication of how your system is performing. The sound of a pump submersed deep underwater may be inaudible. A rise in the pressure gauge reading should be visible as the well pump increases system pressure. The gauge reading should reach its highest point at the same time the pump shuts off. As water flows out of the system, the gauge should reflect the resulting decline in pressure. The pressure control switch has both an upper limit and a lower limit. When the water pressure reaches the lower limit, the pump is switched back on to start another pumping cycle. At that point, the pressure gauge reading should have reached its lowest point and started back upward. If the gauge is functioning properly but indicating inappropriate pressures, the problem may lie with the control switch. The pressure control switch can be reset or replaced if necessary, possibly preventing excessive wear on the pump. The pressure gauge is usually located very near both the control switch and the water pressure tank. Since they are all located above ground, a repair on any of them is often more straightforward than a pump repair. There is a type of temporary pressure gauge that can be attached to an outdoor water spigot. The temporary gauge is attached to a water outlet in the same manner as a garden hose. A temporary gauge might be useful for verifying the accuracy of your primary system pressure gauge. A pressure gauge should be replaced if the glass on its face is broken or if its metal parts appear to be excessively rusty. Older gauges sometimes simply get stuck and stop responding to pressure. Contact a drilling contractor, such as J. A. Schwall Well & Pump Service Inc, for more information about water-well repairs.